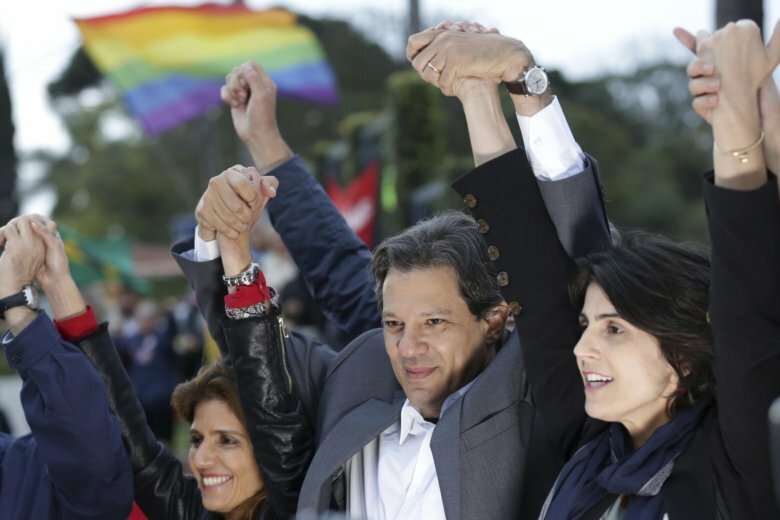 SAO PAULO (AP) — In his first full day as the presidential candidate for Brazil’s Workers’ Party, Fernando Haddad pledged Wednesday to be his own man if elected and not bow to financial markets or the interests of other countries, including the United States. His promise to be his own man came a day after he replaced former President Luiz Inacio Lula da Silva as the left-leaning party’s candidate in October’s election and apparently was directed at perceptions that he will be beholden to his jailed friend and political ally. Da Silva was barred from running because of a corruption conviction and on Tuesday his Workers’ Party officially chose Haddad, who was to have been da Silva’s vice presidential running mate, to lead its ticket. Haddad’s comment about not bowing to financial markets came after Brazil’s main stock exchange fell whenever da Silva improved his position in the polls and jumped after his presidential bid was barred. They want a president “to whom the financial markets can say what they want and what they don’t want. What (U.S. President Donald) Trump wants or what Trump doesn’t want,” said the 55-year-old former mayor of Sao Paulo to a crowd. Haddad said unpopular President Michel Temer did not have the authority to stand up to U.S. Secretary of Defense Jim Mattis, who visited the South American nation in August. “The American secretary came here to tell our government what to do,” Haddad said. Haddad spoke at a meeting with beneficiaries of education programs started during da Silva’s presidency, between 2003 and 2010. The presidential hopeful was Brazil’s education minister from 2005 to 2012, the year he was elected mayor. Four years later he lost re-election by a landslide. “It has my signature and it has Lula’s too,” he said. While da Silva has publicly endorsed Haddad as the Workers’ Party presidential candidate, many wonder whether supporters of da Silva — who had held a clear lead in all polls — will actually listen and back Haddad, who until now had relatively little appeal? The designation of Haddad comes only four weeks before Brazil’s first round of voting on Oct.7. If none of the candidates reaches 50 percent plus one vote – as is expected – there will be a runoff on Oct.28.